I hope you enjoyed my Ignite Annapolis talk “If you always do what you’ve always done, you’ll always get what you’ve always got”. The talk was a really brief – but cheeky – overview of how choices we make in our zoning code and regulations often have unintended results that we really don’t appreciate until much later when we experience the consequences in a very real way. Also, it was a nod to the three people that have had the most influence on my thinking about urbanism: Charles Marohn, James Howard Kunstler and Andres Duany. If you know any of their work, you will hear them loudly in this talk. It was a lot of fun and I hope it was thought provoking, but very challenging to fit more than a few concepts in the ignite format. In reality these issues are multi faceted and never as simple as snarky platitudes. I’ve created this post as an entrance point to help anyone interested in a deeper understanding of these concepts. Zoning and associated regulations can have unexpected results: this is especially true over the long term and often don’t produce what we want/like such as people oriented places we hold in such high regard in Annapolis. Perhaps we can add change to the Ben Franklin quote “…in this world nothing can be said to be certain, except death and taxes.” The question is how do we accommodate change in a way that is not radical? Fortunately we have hindsight from the last 50+ years to learn from. After building cities in a tried and true organic way for hundreds – really thousands – of years, in the space of a several decades, we changed how cities developed without really understanding the long term consequences. I won’t engage in revisionist history and say that we should have know better than to go “all in” on autocentric development because at the time, it seemed like the right thing to do. The lesson is not what we did but how we did it. Ultimately, we did not do it incrementally in a way that could see whether this was a good idea or not, rather it was radical and untried and that is the take home going forward: we need incremental and sustainable change. Let’s consider this as the promise of autonomous vehicles revolutionizing transportation is touted. Let’s not make the same mistake again. You can watch the live stream here (a better quality version on You Tube is forthcoming): I’m the last speaker at 2:16:10, but I highly recommend watching the prior 14! There are number of concepts related to this and are discussed below with links to further reading for a much deeper dive on the subjects. In the talk, I give examples of “walkable urbanism” and “people oriented places” as opposed to “auto oriented places” (Here is an article that describes each). From a qualitative standpoint, they are pleasant areas and that’s why we like them as I discussed, but there is a more fundamental concept behind them: they are fiscally productive. Fiscal productivity is essentially whether the development style pays for itself. ie does the area produce enough tax revenue to pay for the services consumed over the long term? The latter part – over the long term or the full lifecycle as it’s called – is the key. We have to consider what the costs are not just to build the initial infrastructure, but to maintain it in the long run and it’s not always a simple question. Typically developers put in infrastructure, a one time cost, and turn it over to the government to maintain, a recurring cost – forever. Might not be tomorrow, but in 20 years when the streets need to be repaved or in 30 years when the sewer and water pipes need service. Read more on why walkable streets are more economically productive. There are data unequivocally showing that people-oriented streets are more economically productive than auto-oriented streets — from big cities to small towns, from the heartland to the South. The company Urban3 spends much of their time visiting cities and towns across the nation to analyze their tax productivity, comparing how much tax revenue is produced per acre in different areas. What they’ve consistently found is that compact, walkable places produce far more tax value per acre than auto-oriented places—and that holds true in communities across America. Read more on why density is the wrong metric for fiscal productivity. Often people read “compact” to mean just add more density. The question often gets ask “what’s the right answer” on density? There is no right answer because it depends. Ultimately not all growth/development is the same and it requires one “Do The Math” for for your particular place or city to determine what is sustainable. It’s a function of how much the associated infrastructure around a place costs as compared to the tax revenue it produces (public v. private investment). Read more about fiscal productivity in the #DoTheMath series. A STROAD is a street/road hybrid and besides being a very dangerous environment (yes, it is ridiculously dangerous to mix high speed highway geometric design with pedestrians, bikers and turning traffic), they are enormously expensive to build and ultimately, financially unproductive. I single it out in the talk and here because it is so fundamental to fiscal productivity concept. If we want to build places that are financially productive and pleasant for people, we need to identify and eliminate STROADs. In the talk I pointed out Upper West Street where it transitions to 4 lanes near the Goodwill in a number of slides and Forest Drive which are Annapolis’ primary STROADs. Once you have the vocabulary to describe these places, you will explicitly see them everywhere. We need to stop devaluing streets that are fiscally productive by making them into STROADs by attempting to chase away traffic congestion with widening projects. This almost never solves the problem because of the concept of induced demand. You build for cars and you will get more cars. You build for people and you get more people. Read more on what incrementalism is. So often in the context of planning exercises in the city, I hear the term “we have to get it right”. Given the complexity of cities and our lessons from hindsight, it is very risky to believe anyone knows all the right answers and that if they are followed we can predetermine everything perfectly. It’s fine to set a long term vision as we do in our comprehensive plans, but we should take incremental steps to get there. As I mentioned in the talk, smaller steps are not only more palatable for people who are resistant to change, which is coming whether we like it or not, but it’s also a more resilient strategy. If we make missteps, which we inevitably will, we can correct them to minimize their effect. If we make big expensive and expansive changes, the risk is much larger and the mistakes much harder to correct. For example policies like urban renewal had wide ranging effects on cities because they were done at such large increments. Read more on Incremental Growth in the Power of Growing Incrementally series. Ignite Annapolis! - Supplemental information for my 2019 Ignite Annapolis talk. This entry was posted in Annapolis , Urbanism and tagged Strong Towns on March 14, 2019 by Alex Pline. The Forest Drive/Eastport Sector Study takes a small step in the right direction towards a more satisfying future. It is not a plan but it is a hope, a strategic hope. And one must hope and envision in order to get anywhere. We need to accept the study and keep going. The Sector Study does accomplish, among other useful things, a vision. It does this by taking what might seem a radical perspective, and that is the perspective of a person walking from one place to another. Why is this important? Virtually every trip begins with pedestrian infrastructure, whether you are walking or using a wheelchair. People like to walk and ride bikes. You can see this in small and large cities around the country including the older neighborhoods right here in Annapolis. There are several main factors that affect walkability: efficiency, interest and comfort. Trips have to be close, the path has to be interesting, and people need to feel safe and comfortable. People will typically walk a quarter to a half mile such as around downtown, West Street, Eastport, and West Annapolis because it’s pleasant, interesting and often easier than driving. Biking for transportation is pretty much the same except the distances you can cover are about five times longer, up to two miles for the average person. But if the trip is interrupted by unsafe or uncomfortable spots with no easy alternatives, walking ceases to be an option. Unfortunately, this is the situation along the Forest Drive corridor, a typical autocentric pattern where businesses are separated by long distances and the only connection between them is on a sidewalk six inches from 50mph traffic. This environment is hostile outside of a car, so everyone drives even if going between two neighboring businesses. Furthermore, as we’ve seen areas where we attempt to mix fast traffic and commercial activity, the combination ultimately devalues the land resulting in ugly strip malls. The area is this way because we’ve made it this way based on the zoning and autocentric requirements we’ve had in place for a long time. Band-Aid solutions such as adding a sidewalk or a multiuse path to the side of Forest Drive are not reasonable as they don’t fundamentally address the conditions that enable people to want to walk or bike. If we have places like that, we have a real chance to move between them without requiring a car trip. It could be walking or biking or even some kind of specialized transit, like entrepreneurial, privately owned shuttles. Of course, the area will still accommodate cars for people who need to drive and we will always have significant traffic on Forest Drive given it’s the only major road and the number of people who commute in and out of the city. But walkable, mixed-use neighborhoods that are efficiently and pleasantly connected with the rest of the city will cut down on local car trips and provide options for people who don’t drive. As mentioned in the study, under current law there is significant capacity for development now. Stopping the study does not stop development, it just gets us more of the same, which is clearly not working. A popular opinion I’ve heard at public meetings is we have to fix all the infrastructure before we do anything else. That view assumes the status quo, doubling down on an untenable path. At the very least, the vision of the study moves in a direction away from the autocentric policies of the past. Alex Pline is a member of the Annapolis Planning Commission. This editorial is his opinion and does not represent the opinion of the Commission. 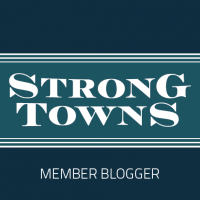 This entry was posted in Annapolis , Op Ed, Urbanism and tagged Strong Towns on March 9, 2019 by Alex Pline. All the brouhaha around the Main Street bike lane has a very strong cultural component that is bubbling just below the surface of the discussion about the project. Sure there are issues of cost and process which are certainly understandable, but most of the visceral dislike revolves around the cultural perceptions of people riding bikes. These same reactions are occurring with bike infrastructure in Washington DC and Baltimore and around the country, so are not limited to our corner of the world. Cultural change is hard and when it happens, there is always a sense of loss. The cultural change that I see people reacting to is two-fold: first, the perception of a “DC-ification” of Annapolis and second, that bikes are a recreational toy. The more the bike lane is discussed, the less it is about the lane itself, but the change it represents. The popular local view that “Yuppies” have invaded and taken over the city since 1980 is very prevalent. People have called me a “carpetbagger” even though I have been here 20+ years, raised two kids here through public schools and been actively involved in the community in a variety of ways. People, especially of my generation and older – I am at the end of the boomer years – resent popular hipster culture and those they perceive as part of it, as it waters down the “Annapolitan” identity. Biking by young people for transportation and by “MAMILs” (Middle Aged Men in Lycra) on expensive bikes is viewed as the canary in the coal mine for a litany of undesirable changes from urbanization and traffic to increased costs of living and the death of traditional mom/pop retail, typically expressed in the coded phrase “destroying our quality of life”. In the 1970s biking was marketed as a recreational activity and not for transportation. Cars are for doing serious work and we have all graduated to “big boy underpants” by driving cars to get around. There are many reasons for this, but suburbanization and its reliance on the automobile is seen as progress in the post-war era and is a predominant attitude of baby boomers. This along with the mom and pop retail stores, muscle cars, a working waterfront and the old Market House is emblematic of the pining for the “real” Annapolis of the 1970s before the “Yuppies” came. 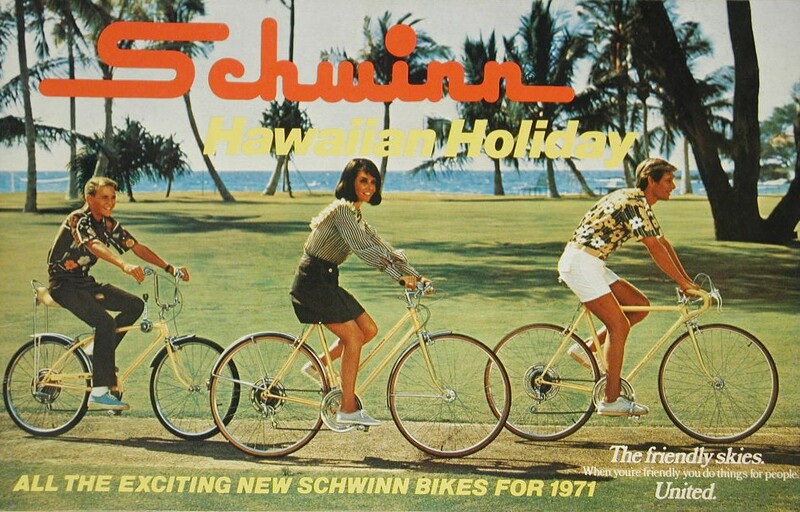 The cover of the 1971 Schwinn Catalog showing the kids riding bikes on vacation strongly markets cycling as a recreational activity, not as a means of transportation. In cognitive psychology and decision theory, loss aversion refers to people’s tendency to prefer avoiding losses to acquiring equivalent gains: it is better to not lose $5 than to find $5. The principle is very prominent in the domain of economics. What distinguishes loss aversion from risk aversion is that the utility of a monetary payoff depends on what was previously experienced or was expected to happen. Some studies have suggested that losses are twice as powerful, psychologically, as gains. The ban on smoking in restaurants mentioned at the hearing is a great example of this. Restaurants claimed loudly that their business would be dead in a week if the ban was passed. The reality ended up being that it greatly improved restaurant business because it brought out all the people who refused to go because of smoking. Ultimately, there is pent up demand the status quo suppresses. This is also true for local recreational trails such as the B&A, Poplar and the trail around the Navy Stadium. These were all opposed because of the perceived negative consequences, but are now seen and sold as “amenities”. With respect to protected bike lanes, NYC has shown virtually no negative consequences of reducing vehicle lanes in lieu of protected bike lanes. At the time the conventional wisdom was this would result in gridlock and be an economic catastrophe. There are changes happening in Annapolis that people do not like, I certainly get that; even some I may personally not like. But change is inevitable. Are these changes good or bad? That’s obviously a matter of opinion, but think of it this way: would you rather have an Annapolis that is experiencing severe economic distress like many of the small towns throughout the country that have been depopulated over the last 30 years, or a town that is experiencing distress at the opposite end of the spectrum where population is increasing and there is economic vibrancy? I certainly would like more of the later than the former. I don’t want Annapolis to be known as the place that always says “no” when it requires us to change our habits. And finally, some parting words on the changing attitudes towards cycling in the United States. Eben Weiss, known as “Bike Snob NYC” an acerbic commentator on cycling culture hopes we can just make cycling seem normal in this country as is common place in other parts of the world. We’re able to comprehend riding bikes only as a means of recreation; confounded by the practical; aghast at the notion that women and children should be exposed to this high-risk action sport. Hey, I’ll take being told I’m doing the coolest thing somebody’s ever seen, and it sure beats having things thrown at me from car windows (this has happened to every cyclist), but what I’d like even more would be if what I was doing was so commonplace as to be utterly not worth mentioning. For Annapolis, I too share this hope. This entry was posted in Cycling, Op Ed, Transportation on September 12, 2018 by Alex Pline. The City of Annapolis Forest Drive/Eastport Sector Study, one of the “neighborhood” plans that rolls up in the city comprehensive plan is in full swing. There were a number of public meetings which I attended and a variety of presentations and work sessions with the Planning Commission, some of which I have also attended. My main comments on the plan over time – the area is in general the newest part of the city and the most auto oriented as outlined in a prior piece on street grids – revolve around a bifurcated view of the goal of the plan. People who just pass through the area (both city and county residents) do not want any changes that affect auto mobility. They focus almost exclusively on the traffic engineering portion of the plan and only comment on the land use and other parts in so far as they don’t want changes that bring people and in their opinion, more cars. There is the other side of the street that would like to see the area more urban in nature with less emphasis on auto mobility and more on traditional urban development with a more human scaled setting for buildings, economic and residential activity, and mobility. It is this dichotomy that causes some cognitive dissonance in the plan. Strong Towns points out as a core principal that these two are fundamentally incompatible and result in a STROAD which we currently have. The worst of both worlds, people, auto oriented commerce and fast moving cars. I have expressed this philosophically in public meetings and to staff, but I’m not sure there is really anything fundamental that will come out of that. Because of this dichotomy, I assume the plan will pretty split the difference (status quo) or attempt to do both which will read with the same cognitive dissonance I see now. Leaving or entering the City of Annapolis by bicycle requires crossing the ring of automobile-oriented arterial roadways that surround the historic core of Annapolis, including: Roscoe Rowe Boulevard (MD Highway 70), US Highway 50/301, Solomons Island Road (MD Highway 2), and Aris T Allen Boulevard/ Forest Drive (MD Highway 665). Bicyclists of necessity can be seen in all parts of Annapolis, weaving routes through neighborhoods and often on sidewalks to access commercial and employment destinations. The existing network of off-street bicycle facilities is similarly discontinuous, but provides the initial links in what will be an exemplary regional trail network, connecting neighborhoods and forming the core of Annapolis’s future Bicycle Network. I appreciate the updates in the May 31 draft of the sector study that brings bicycle mobility to the forefront. Both the short term and long term issues are addressed in section 2.7.2.2, Bike and Pedestrian Networks, as well as the potential solutions in section 3.4 Mobility: Pedestrian and Bikes. Building on the discussion of the issues and potential solutions, it is important to go into additional detail because the efficacy of bicycle infrastructure for both transportation and recreation is very dependent on the implementation. I refer to an article published on strongtowns.org (https://www.strongtowns.org/journal/2014/5/19/follow-the-rules-bikers.html) which discusses the auto-centric cultural bias of planners and engineers and how it affects bicycle and pedestrian infrastructure implementation. Perhaps equally important is how this bias affects public perception of this infrastructure. I encourage you to read the entire article. With this in mind, when the city begins to implement infrastructure outlined in the sector study, we have to make sure it is done in a way that does not just accommodate bikes in an auto-centric environment, but results in a network that is not only safe, but also contiguous, fast and comfortable. If we expect to shift mode share based on this infrastructure – that is to fully realize the return on investment – there must be a definite “value add” for bike riders. For example, faster transit time, bike parking at the front door of the destination, and/or a more pleasant trip. If we always give priority to the auto mode, why would someone chose to ride a bike? This is the most common criticism. Or worse, it incentivizes breaking the law which is always most unsafe for the bike rider because this infrastructure prioritizes the mistakes of drivers over the mistakes of bike riders. The following examples illustrate this bias towards the auto mode and implementation suggestions that attempt to remove this bias. This bike path requires cyclists to stop at every curb cut. Anyone trying to get down this bike path bike will likely never fully stop, resulting in a very unsafe situation. In the study area, the existing path near the Safeway grocery store is typical of US-based infrastructure along arterial roads where it is clear the path users are secondary because the turn radii are large and the auto lanes uninterrupted which promotes fast vehicle movements in an area designed to (minimally) accommodate pedestrians and bike riders. In a similar vein to the visual examples of community character in the draft document, examples of well-designed bicycle infrastructure – we can look to the Dutch for inspiration – will help guide future implementation. The Dutch are not only leaders in urban bicycle infrastructure, but also suburban bicycle infrastructure. The You Tube Channel “Bicycle Dutch” (https://www.youtube.com/channel/UC67YlPrRvsO117gFDM7UePg) is an excellent resource for examples of both. Contrast the above images with this Dutch junction design where the bicycles are given priority and this priority is supported by the visual treatments on the pavement. Additionally, an east/west separated path along the corridor should be as isolated from the major arterial as far as possible. Not only will this make the user experience more pleasant, but will move conflict points away from arterials and allow for vehicle speeds to decrease before a conflict point. This is consistent with the complete streets philosophy and many of these ideas are also discussed in the National Association of City Transportation Officials Urban Street Design Guide (https://nacto.org/publication/urban-street-design-guide/). There are a number of areas that are slated for development along the corridor that the city should require this type of design as a condition for the development such as The Village at Providence Point and Rocky Gorge (at least garnering an easement for when a path can practically be extended along Aris T Allen). Furthermore, around Annapolis Middle School, there is copious right of way owned by Anne Arundel County that could easily be used for this path and would significantly benefit the children who attend the school. This would also mitigate the current safety concerns resulting from the recent crashes involving school children. Funding for this area of the trail could be sought through the federal Safe Routes to Schools part of the Transportation Alternatives Program. Given the corridor is a priority residential development area, the large number of existing commercial services and the lack of non-auto infrastructure, construction of this path along the entire corridor should be the highest priority in the capital improvement project recommendations. This entry was posted in Advocacy, Annapolis , Cycling, Transportation, Urbanism and tagged Strong Towns on June 20, 2018 by Alex Pline. Can Art and Historic Preservation Coexist? A version of this article When Public Art and Historic Preservation Clash appeared at Strong Towns on May 24, 2017. Annapolis is the historic capital city of Maryland and harks back to the Colonial days of the United States. The city’s core contains a lot of the historic fabric from the 1700s, 1800s and 1900s including historical gems such as the Maryland State House where the Continental Congress met in the 1780s, the William Paca House (1760s) and many others of lesser fame. While there was some significant demolition in parts of the city over time, fortunately the ravages of the urban renewal years did not gut any large portions of the core downtown and the influence of the automobile was minimal on the street size and configuration. The preservation of the historical character is in large part due to the efforts of organizations such as Historic Annapolis and through Maryland and Annapolis Statutes as implemented by the city Historic Preservation Commission (HPC). Without these heroic efforts beginning in the 1950s and 1960s much more of the historic fabric might have been lost. Fast forward to the present. Annapolis is generally a healthy and thriving city and is a very strong tourist attraction thanks to the aforementioned historic fabric. However, like many towns and cities, it struggles at times to keep the core areas thriving for locals beyond the standard tourist attractions. In addition to the historic Main Street area that is within the area governed by historic preservation rules, there is another close by area of West Street that has undergone quite a renaissance over the last 20 years with new shops and restaurants thanks to an innovative group of restaurant owners, artists and entrepreneurs who have coalesced the area into an “arts district”. This is due to there not being not a lot of scrutiny when this area was economically depressed. This redevelopment mimics reinvestment in cities where there is little regulation, as Andres Duany says “when government is not watching”. It’s page directly out of the Strong Towns playbook with events such as a weekly “Dinner Under the Stars” and the, “Chocolate” and “Fringe” festivals all organized at the grass roots level with great success. Compare these two approaches, one top down with codified rules and regulations at multiple levels of government and one bottoms up, with a “try lots of ideas and see what works” mentality led by hyperlocal citizens. When these two meet, in the case public art, there is clash of control. While much of the “arts district” is outside the historic area boundary, there are a few buildings that are part of the arts district within the boundary and when one owner was cited for peeling paint, he enlisted a well known local artist to do the painting – with a mural. Time Lapse – Tsunami Mural Annapolis, MD from Power Play Creations on Vimeo. The response from the city was heavy handed, serving a court order to either repaint it or apply for a retroactive permit. While the HPC code does not specifically regulate paint it does regulate “architectural alteration”. This means the owner would have been completely within his right to paint it a non-historically accurate (whatever that is) color, but the fact that there was “art” in the image made it an “alteration”. After boiling away all of the legal minutia of this disagreement, it comes down to a control issue, not unlike those around Tiny Free Libraries. To be fair, the city says they might approve this particular mural, but they want make that determination. Voices from both sides from a movie trailer “Cataylst” about the mural by Power Play Creations on Vimeo. Beyond the specifics of this particular interpretation of the Annapolis historic preservation code, this situation is a prime example of two schools of thought on how to build great places, but with diametrically opposed approaches and represents the somewhat bi polar nature of Annapolis’s culture. Some resist change because change is negative and some encourage change because change is good. For better or worse the court case – at least this edition anyway – was just resolved in favor of the city. Tension between these cultures is certainly healthy as monocultures are fragile. But when the argument is more about control than substance, in my opinion the balance has shifted away from historic preservation’s original intent. Paint is truly ephemeral as the arts community showed in their cheeky response by staging a “mural funeral” when a second mural was cited by the city. While historic preservation is critical for cities such as Annapolis, with all of the problems the Annapolis has, and yes, even though we are a small historic city we have many of the same problems larger cities have, spending money and effort on legal challenges is not effective solution to improving the city. Additional hurdles to revitalization based not on substance but control, especially those at the grass routes level, are the last thing the cities and towns need. This entry was posted in Urbanism and tagged Strong Towns, Strong Towns OpEd on May 19, 2017 by Alex Pline. I recently appeared on The Maryland Crabs Podcast, a podcast that covers the waterfront of local topics, to discuss parking, transportation and biking in Annapolis. In my role as Chair of the Annapolis Transportation Board, the subject of parking comes up at almost every monthly meeting. Since I’ve been in Annapolis, parking has always been handled in a fractious and ad hoc manner by the city. There have been many studies and virtually every transition team for an incoming mayor has recommended reforming the parking policy to be “holistic” so that all of the parking facilities (metered spots, residential parking permits and parking garages) all work together as a “system”. Despite these recommendations, the city has never been able to accomplish this goal on its own. The Pantelides Administration made it a goal to implement this idea and actually did through a contract with SP+ Municipal Services, a national player in parking management. Of course people in Annapolis hate change – any change of any sort – so the implementation of the contract has not been without its detractors. One of the goals of hiring a “playa” in the parking management business is that they, as subject matter experts, can bring state of the art ideas in parking management to the table and in fact one of their contract deliverables is a Parking Utilization Analysis (full report, large PDF) in Annapolis that would contain recommendations for parking policy changes in the city (summary in The Capital). As these recommendations filtered out to the public opinions on social media were abound. I got into it with John Frenaye and Tim Hamilton over their assertion that this contract was a “money grab” by SP+ and the city and other misunderstandings about the effort. So they invited me on the podcast to talk about this and my other passion, transportation cycling. It was a fun experience and a great conversation to bring some perspective to this activity for people who have not been intimately involved. Unfortunately, we did not have as much time to talk about biking, which could fill an entire podcast itself, but I did make a few key points about transportation cycling in Annapolis (we need more connectivity!). It was a lot of fun and we had a great conversation. According to Tim, there has been very positive feedback and a higher than usual download rate. I hope to be back on in the future to discuss the nexus of transportation, land use and municipal finances, because these are typically viewed as separate, siloed issues, when in reality they are different facets of the same issue that interplay in ways that most people don’t really understand. This entry was posted in Annapolis , Cycling, Transportation on March 30, 2017 by Alex Pline.